When you open up a math text with your children, it’s likely that they will groan and say, “Mmmaaath?” in a sort of dramatic whine. There are certain tricks I have used to make their textbook more interesting. I find early math much more amenable to these tricks. Bear, now at third/fourth grade math rarely needs or wants manipulatives so I have been at a bit of a loss for her, but thankfully, Life of Fred math and Beast Academy are keeping the “Aaawww, mmmmaaaath?” from escaping her lips. So how do I add sparkle to a math lesson? 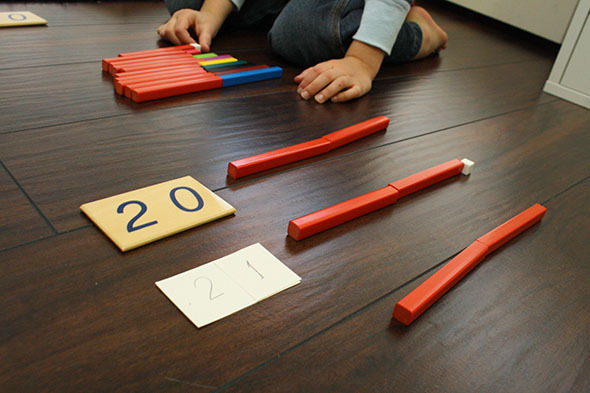 For J-jo, I add manipulatives and games. This particular page of a 1st grade Singapore book is teaching the numbers from ten to twenty. I glanced at the book, and then shut it, and took out our Montessori Teens board. I made ours by printing out a teens board from somewhere (here’s one) and then gluing popsicle sticks to it so that J-jo would get the same feel as if I had bought the pricey version. 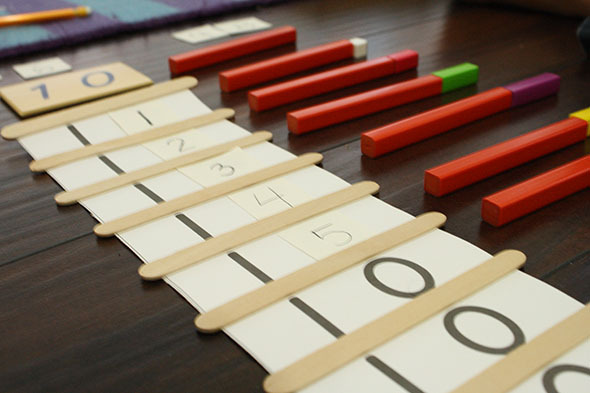 He can slide the numbers between the popsicle sticks and this is a very satisfying task at his age. You could easily just draw your own teens board on the fly. You can see a different way I did the same lesson with Bear three years ago. I teach my children to say their teens the Rightstart way, so J-jo is learning that eleven is also known as one ten one., twelve is called one ten two, and so on. This will help him remember to write the one first when writing his teen numbers (I had third graders who always wrote 21 when they meant 12). 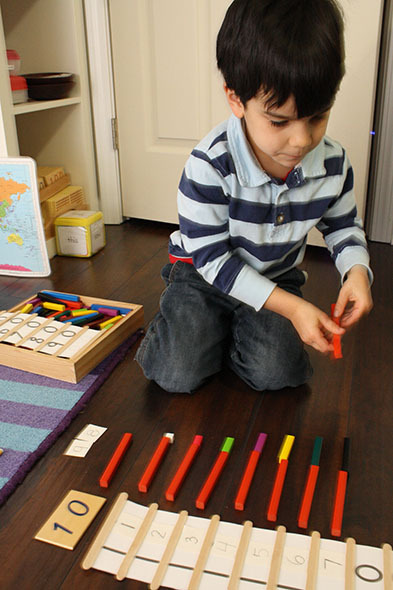 J-jo then builds the numbers with the cuisenaire rods. The lesson stopped at twenty, but J-jo realized the pattern and wanted to keep going a bit further. 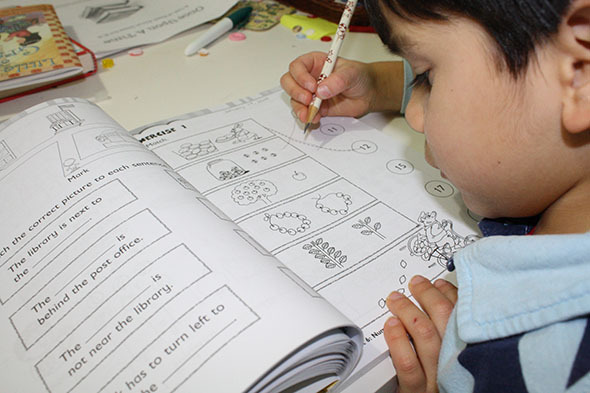 Then he was ready to do the workbook. 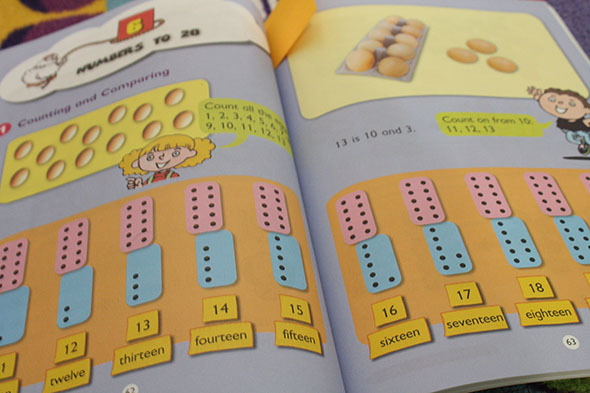 Using the text book as reference and creating hands-on math lessons makes the subject less tedious. 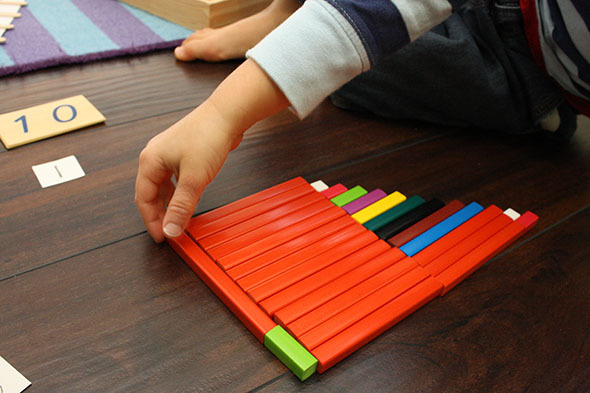 It brings play into the lesson and allows students to figure out patterns as they explore the material through the manipulatives. It makes prepping for math longer, but am I not called to be the best teacher I can be? (And lest you think I have the energy to always make math fun, I don’t. It’s often just drudgery done via pencil and paper.) However, I owe it to my students to make the effort as often as I can. I always tell J-jo, “let’s play a game,” when it is time for a math lesson. I try not to say, “let’s do math,” or he’ll tell me, “No, thanks! I am going to play!” Thanks for your comment, Jae! I was dismayed to find K hate math after all the talk about wanting her to love math. So we’ve backed away from Singapore math and even Miquon. Instead we are going through a deschooling period and been doing Life of Fred, lots of game time, and Dreambox. May try Marilyn Burns group work to see if the love comes back. Julie! Love this idea. I, too, find that sometimes we need to step away from the workbooks and do some hands-on math. I’m currently trying to figure out a way to help one of mine learn times tables because we’ve hit a bit of a wall. Michele, I will have to do a post about times tables. We do a lot of skip counting – all the songs from Classical Conversations. But my 6 year old hasn’t internalized the multiplication table yet, she just skip counts to find her answers. Rightstart has some great games, but I need to pull out my book. I haven’t looked at it in a long time.